We had dinner at TGI Fridays near our place one Sunday. Since we’re only three (two adults and one kid), we opted to order their Filipino Platter, a combination of Roasted Half Chicken, Grilled Baby Back Ribs and Grilled Filipino Pork Liempo, served with fresh greens. Hubby and I liked the fall-off-the-bone tender and uber flavorful Baby Back Ribs the most. The soft and juicy Filipino Pork Liempo was delicious, too, and the Roasted Chicken was likewise seasoned well. Food this good was hard to resist, so you bet I ate a lot more than usual that night. Lol! 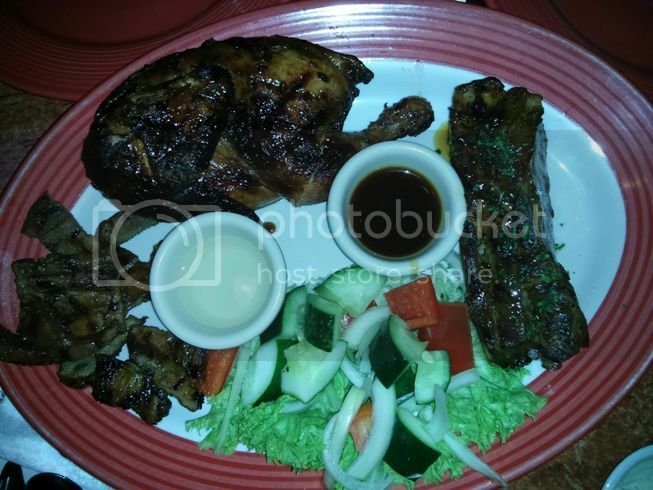 This entry was posted in Filipino Platter, Robinsons Galleria, TGI Friday's. Bookmark the permalink.